The No. 5 Action Express Racing Corvette DP team celebrates in victory lane after winning in the Rolex 24 at Daytona International Speedway. The car was powered by an Earnhardt Childress engine. Four years ago, when Jimmie Johnson decided to race for Bob Stallings in the Rolex 24 at Daytona, the team reached out to Earnhardt Childress Engines to power his ride. On Sunday, ECR engines swept the podium at Daytona International Speedway with the Nos. 5, 10, 9 Corvette DP teams — as well as the No. 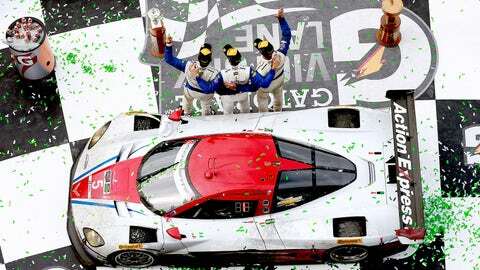 90 squad — finishing first through fourth in the TUDOR United SportsCar Championship’s Prototype class. Although Richard Childress’ Welcome, N.C.-based company has built winning engines in stock car competition for three decades, with the Rolex 24 spanning more than half a century, ECR is relatively new to the sports car game. However the merger of America’s two largest sports cars series – American Le Mans and Grand-Am Rolex – led to the development of a new engine for the Chevrolet Corvettes in the Prototype Class. Gone was the 5-liter LSX engine from last season. In its place was the 5.5-liter LS9 boasting 600-horsepower -- 70hp more than its predecessor. With the time of the first two races — at Daytona International Speedway and Sebring International Speedway – lasting 36 hours, Richie Gilmore, ECR chief operating officer, understood that the greatest task for his group would be reliability. Will new rules make Johnson happy or sad? "The big challenge for us this season was the increase in horsepower so the guys worked really hard, but a big group effort went into it," Gilmore said. "We did a lot of testing in the offseason. Definitely with the big power increase we had to reconfigure the head gasket – we had some head gasket issues – there was a big effort going into it. To complicate the situation, IMSA changed the engine rules between testing at the Roar before the Rolex (Jan. 3-5) and this weekend’s event. While Gilmore is "proud" of ECR’s work ethic, he acknowledges the group could not have acclimated to the changes without the combined effort with Chevrolet. The commitment to right the situation was not lost on the Chevy teams. Four-time Champ Car champion Sebastian Bourdais, who took home his first Rolex Cosmograph Daytona timepiece (awarded to the winners in each class), was ecstatic with Chevy and ECR’s contribution. There's no one like Danica, both on and off the track. Check out some of our favorite photos of Danica action. Over the past four years, ECR has created a designated department to service the six sports car teams. There are currently six employees who travel the circuit and oversee the 23 engines currently in rotation. Although NASCAR is ECR’s primary focus, for Richard Childress Racing the victory is a constructive way to kick off the 2014 racing season. "This is a great race," Gilmore said. "There’s a lot of heritage behind it. This is our fourth season running the Rolex. We really like this series. To come out last season and win the championship with Wayne Taylor, we take a lot of pride in that. 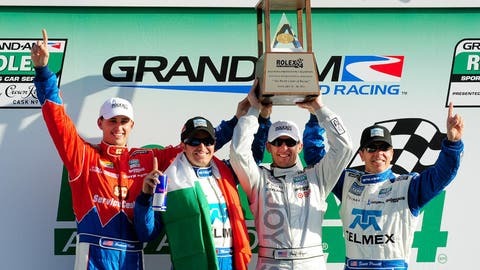 Team owners Chip Ganassi and Michael Shank won the Daytona Prototype classes in the Rolex 24 the past two seasons. However, there proved to be growing pains for the Ford teams with the introduction of the EcoBoost engine and the consequent rule changes before the weekend’s race. Their best result? The No. 02 Chip Ganassi Racing entry which finished 15th overall and eighth in the Prototype class with Scott Dixon, Tony Kanaan, Marino Franchitti and Kyle Larson. Nair added that engineers suspected the No. 01 Ganassi Racing Ford, the defending Rolex 24 champion team, suffered an engine failure after 22 hours and 28 minutes. Still, Nair was âpleasedâ with the performance of Ganassi’s No. 02 Ford and the No, 60 Michael Shank Racing Ford which finished 47th overall and 12th in class. However, five-time Rolex 24 winner Scott Pruett felt the Ford teams were behind the curve entering the event. Roush Yates Engines provides the power plants for the Ford cars in both IMSA and NASCAR. Ricky Taylor has no intention of quitting his day job driving Corvette DPs for his father at Wayne Taylor Racing. The 24-year-old native of Surrey, England, who currently calls Apoka, Fla., home, impressed the scouts at Richard Childress Racing during a test with Austin Dillon at Virginia International Raceway. Still, Taylor has no intention of leaving the tour he loves. "It was a lot of fun," Taylor said of the test. "But I think at the end of the day it comes down to money. You know, I’m really ingrained in sports car racing and with the new series It’s really a great time to continue my career here and try to build a life her rather than risking everything and going that way.